DESPERATE LIVES: Say No To Drugs, Say Yes To Overblown Message Movies – Schlockmania! The 1970’s are usually pinpointed by cult movie types as the golden era of made-for-t.v. filmmaking, the time where television networks veered into schlock territory as they tried to prove they could be every bit as hard-hitting as what was unspooling at the cineplex. However, the 1980’s are just as strong a time for schlocky t.v. fare and delivered plenty of gems worthy of exploration for exploitation film fans. Anti-drug movies from the 1980’s in particular tend to be memorable, particularly when the filmmakers’ good intentions outpace their understanding of drug addiction. 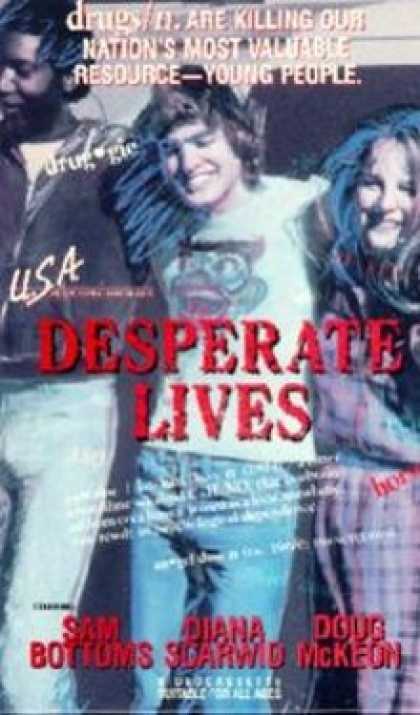 One of the all-time classics is Desperate Lives, a wild anti-drug effort that goes to nihilistic extremes to drive its impassioned message home. Desperate Lives establishes its subtle-as-a-flying-mallet tone with its first scene, in which hepcat drug dealer Ken Baynes (Sam Bottoms) waits for his teenage customers in a graveyard. Soon we are introduced to Scott (Doug McKeon) and his older sis, Sandy (Helen Hunt), en route to their first day of school. Helen tries to look out for her impressionable little bro, despite occasionally doing drugs with a dope-loving boyfriend. Ken takes note of Scott and begins the process of grooming him to be his assistant dealer. It’s also the first day of school for Eileen Phillips (Diana Scarwid), a guidance counselor with uber-naive dreams of helping the kids realize their potential. She quickly discovers the school is a veritable drug den where tired teachers turn a blind eye while kids toke up during pep rallies and administrators put anti-drug programs on the back burner. Eileen reaches out to Doug to help him but “pressure” keeps him turning back to drugs, despite the potential of a relationship with fellow student Susan (Tricia Cast). Pretty soon, the kids are dropping like smoked-out roach-clips as Eileen grows ever more frantic in her desire to put an end to this epidemic. 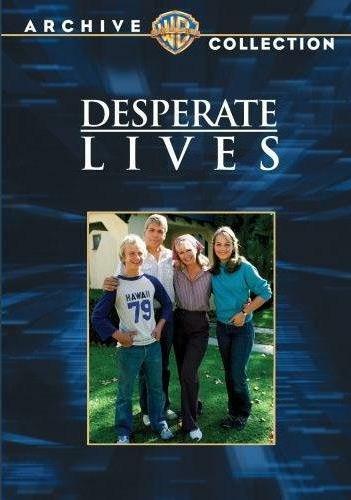 Desperate Lives is best known to casual viewers as “the movie where Helen Hunt jumps out a window after snorting PCP.” Rest assured, that scene is here and is every bit as hysterically overblown as it sounds. Ditto for the film itself. It was penned by Lew Hunter, a respected screenwriter and t.v. exec who has also penned respected texts on the art of screenwriting. His work here is competently structured and keeps the viewer engaged – but it’s also unintentionally hilarious and riddled with cliches. Every familiar anti-drug flick moment is trotted out here – “the first hit is free,” “everybody’s doing it, “she’s just a doper,” etc. – and the dialogue is full of clinkers in its attempts to approximate genuine teen lingo (“Don’t hassle me, pansy! I can handle.”). Hunter is passionate about his message but so woefully out of touch with the realities of his subject matter that the proceedings instantly devolve into camp hilarity. He also goes for sledgehammer melodrama wherever possible, which doesn’t help his cause: every argument becomes a shouting match and quiet o.d.’s are avoided in favor of extended, shriek-heavy freak-outs. The second half of the movie piles on the mayhem with sadistic glee and then suddenly switches gears to give viewers the most absurd and implausible “inspirational” finale possible. Robert Michael Lewis, another t.v. vet, directs the proceedings in an anonymous manner and the blandly competent backdrop he provides for the tale makes its freak-outs and the shouting matches all the more unnerving. However, the element that puts Desperate Lives over the top is the acting. McKeon rants and whines with the best of them, Bottoms is perfectly oily as the smooth-talking dealer and Scarwid is all nostril-flaring sincerity as the ineffectual counselor (her idea of showing Scott an alternative to drugs is to take him on a friggin’ bike ride). Hunt is subtle compared to the aforementioned trio and probably fares the best but her PCP freakout is a schlock moment for the ages (it was famously immortalized in a 1990’s-era Saturday Night Live skit). Cult film aficionados will be pleased to note the presence of The Brood‘s Art Hindle as Scarwid’s neglected boyfriend and John Carpenter regular Tom Atkins and Diane Ladd as the parents of the doomed teen heroes. Ladd in particular is a lot of fun as the hard-driving but naive mom, scoring a grandly obnoxious monologue about how easy her kids have it. In short, the mixture of well-intentioned yet misguided notions about drugs and go-for-broke melodrama at play in Desperate Lives make it a perfect cinematic speedball for camp cinema devotees. It’s even got a swell theme song by Rick Springfield. Spend 100 minutes with this flick and you will definitely be high on schlock. Schlock-Wire: DARK NIGHT OF THE SCARECROW Coming To Blu-Ray From VCI In Time For Halloween! I think you meant to say, “The one where Helen Hunt jumps out a window and into Paul Reiser’s heart”. Best Keyboard Cat video ever.